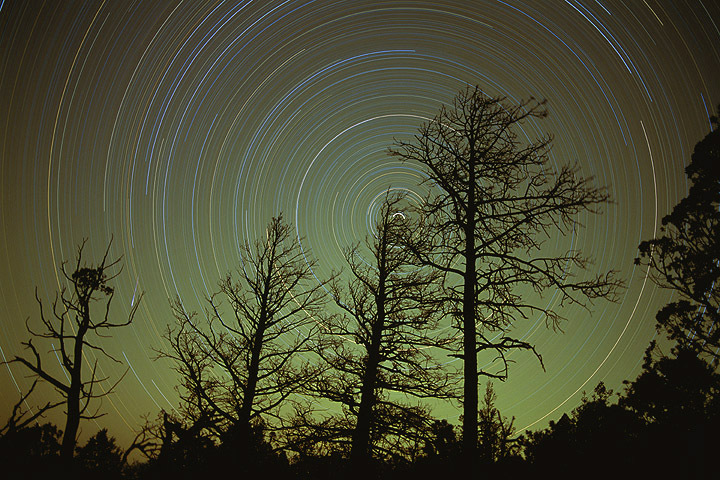 From the top of the Guadalupe Mountains in west Texas, circular star trails and meteor. Circular star trail photos are pretty easy once you understand the basics. Locate the north star then start looking for a foreground subject that will stand out against the spinning stars, such as trees and rock formations. Set up your tripod and camera, carefully frame your subject, set the focus to infinity and the aperture wide open, attach your cable release, then open the shutter. Close the shutter before sunrise.